Pav bhaji is a popular mumbai street food. 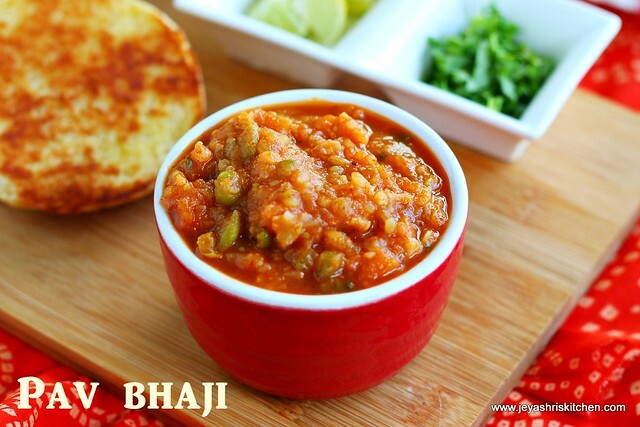 I have already posted pav bhaji recipe with step wise pictures, but this pav bhaji recipe is without onion and garlic. I have also given a full video of the recipe of pav bhaji masala. I wanted to post the recipe of home made pav bhaji masala powder too but will share it soon here. Jain version of pav bhaji is different from this one as authentic jain pav bhaji will not include potatoes too. 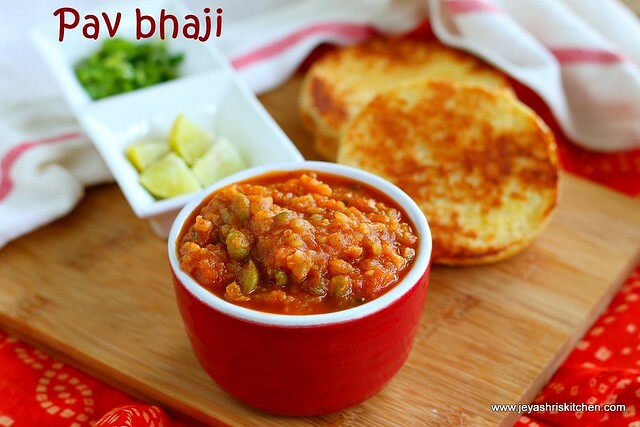 Try this no onion no garlic pav bhaji recipe at home and let me know how it turned out. My kids enjoyed it after coming back from school and didn't realise the difference in taste without onions. Check out my other no onion no garlic recipes . I have given the same recipe in my kungumam thozi supplement book which got published 2 years back. Pressure cook the veggies and potatoes till 3-4 whistles. Grind the ginger and green chili into a coarse paste. Add butter in a pan and add the ginger chili paste. Cook for a minute in a low flame. Add in the chopped capsicum. If you want to add onions add it now. Cook for a minute. Add in the tomato puree. I used home made tomato puree. You can just grind 2 tomatoes and add it to the pan. Add the red chili powder, cumin powder, pav bhaji masala and salt. You can also add home made garam masala also instead of pav bhaji masala. Mix well and add the boiled veggies and the potato. Peel the skin of the potatoes after boiling. Add 1/2 cup of water. Mash this using a potato masher. Let this boil for 7 minutes in a low flame. Be careful and stay away. The gravy may slightly splutter. So keep in a low flame. Switch off the flame and add the coriander leaves and lemon juice. Mix well and if you want add 1 tsp of butter and serve with toasted pav buns. While toasting the buns you can add a pinch of pav bhaji masala in the butter and toaste the buns. This will enhance the taste. To make it a jain version replace potatoes with raw banana. Add water to alter the consistency of the gravy. Sweet corn, beans, yellow pumpkin can also be cooked and added to the gravy. Thanks jeyashri for the quick reply . Sorry I accidently deleted my query . Oops !